If My Groom Doesn’t Dance Like This, I’m Not Getting Married! If you haven't seen Hasan Minhaj’s speech at the White House Correspondents’ Dinner, then you must be living under a rock. And if you've seen it, then I'm pretty sure you went straight to Netflix and watched Homecoming King. And there is just no way for a girl to have watched all of that and not fallen head over heels in love with this hilarious guy. No, really. Who doesn't love a good-looking guy who can make you laugh? But alas, he is married, ladies. Yes, I was quite heartbroken about that too when I found out while watching his Netflix special. But then our social media stalker-ish tendencies have no end, of course, so when I found this gem of a video being shared on Facebook (uploaded by Bollyshake), I almost died here in my chair. 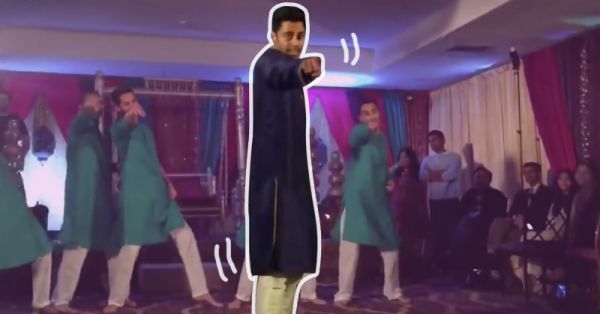 So here is a video of Hasan Minhaj, dancing at his own wedding function, on Saajan Ji Ghar Aaye. And after watching this, I can say for certain that if a guy wants me to take those saat pheras with him, it ain't gonna happen if he doesn't do something similar to the dance in this video. No, I'm actually very serious, it's a make or break thing I'm talking about here. Do you want to know why I'm creating such a fuss? Watch the video here and get ready to form a massive crush! Hasan Minhaj is officially perfect! 😍 #HomecomingKing now on Netflix!